The Akashic Noir Series is a reliable delivery system for dingy tragedies, deadbeats, and broken-down dreams, but it shines even more as a destination-by-destination travelogue. 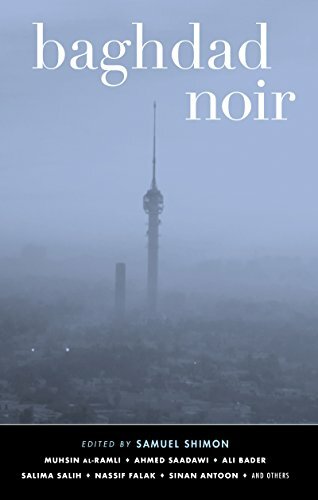 Baghdad Noir, edited by Samuel Shimon, exemplifies that. Baghdad Noir has some standout stories, but the most essential reading in it may be Shimon’s excellent, thoughtful introduction, which breaks down the literary history of Iraq and explains that the reader may well be holding the first anthology of Iraqi crime stories. Noir themes may be embedded in the fabric of Iraq, but noir as a literary tradition is not. If that means that the stories in this volume are somewhat uneven, it is a small price to pay for their freshness and richness. Classic themes are seen from unusual angles and explored with striking results. A regular noir reader will find much to love here, and a reader who wants some armchair tourism will find a dark and enthralling look at a world few Americans have seen. Few cities are as well-suited to Akashic’s geographic focus. The instability of Baghdad is a recurring theme across the stories; the city is a home, a threat, and a shifting political map with unpredictable danger zones. People are living on top of each other in these stories—neighbors show up again and again as witnesses, suspects, and corpses. The perfect living situation may be worth killing for. Reclaiming a home may mean surrendering to the pull of madness. The police are unreliable—sometimes skilled, yes, but sometimes inefficient and sometimes mundanely corrupt—and that unreliability is an accepted fact that the authors use effectively for horror and uncertainty. The lushness of much of the scene-setting only makes the stories’ gothic turns more chilling. The honor killing in Hussain al-Mozany’s “Empty Bottles” feels nightmarish enough—“I could see the severed hand,” the narrator reports, “which looked plump and pale yellow and was covered in dried blood. I saw it clearly, and I realized that it had to be the hand of a woman who was still young”—that it is unsurprising that it eventually starts to feel like one. That last line especially is the through line of many of these stories. In Baghdad Noir, the down-on-their-luck protagonists are not the only ones living with overwhelming grief, not the only ones capable of committing horrors for fortune or even just to clear their heads. In Ahmed Saadawi’s “A Sense of Remorse,” the hardest thing for some men to face is feeling nothing, being absent that “ecstatic anger.” That is the true rock bottom of noir. In Layla Qasrany’s “Tuesday of Sorrows,” in chilling riff on the classic Chinatown line, one man listens patiently to the unraveling of a conspiracy. His reaction is measured and exquisitely bleak: “‘Unfortunately, we all know they’re killers, my friend.’” Baghdad Noir is about living with that knowledge until something finally breaks. Zoë Z. Dean is the author of the short story "Charcoal and Cherry," winner of the 2018 Thriller Award for Best Short Story and the short story “Getaway Girl,” winner of the 2015 Mystery Writers of America Robert L. Fish Memorial Award and a Distinguished Story in Otto Penzler’s Best American Mystery Stories 2015. Her short fiction has appeared in Ellery Queen’s Mystery Magazine.